Most of my rants about the poor state of data visualization are aimed at business intelligence software vendors that dabble in the field without understanding it, resulting in poorly designed and ineffective software. Every once in awhile, however, circumstances prompt me to redirect my aim toward the academic visualization community. Even though academic researchers are responsible for most of the breakthroughs in the field of visualization, they are sometimes responsible for downright clueless visual communication and for colossal wastes of time and effort. In the last two days I’ve noticed several blog entries about something called “A Periodic Table of Visualization Methods.” This is the work of two fellows at the Institute of Corporate Communication, University of Lugano, Switzerland. It was recently published in the paper “Towards a Periodic Table of Visualization Methods for Management.” Coming from an institute that focuses on communication, it is especially alarming that this presentation of visualization methods communicates so poorly. Before commenting further, let me show you the table. Click to view a larger interactive version. The periodic table of elements, unlike this table that was modeled after it, is quite effective in design. It works because its organization reflects the meaningful attribute of each element’s atomic number (the number of protons in the element’s atomic nucleus). The two-character abbreviations that it uses to label each element work because they are the standard abbreviations that are used by scientists. 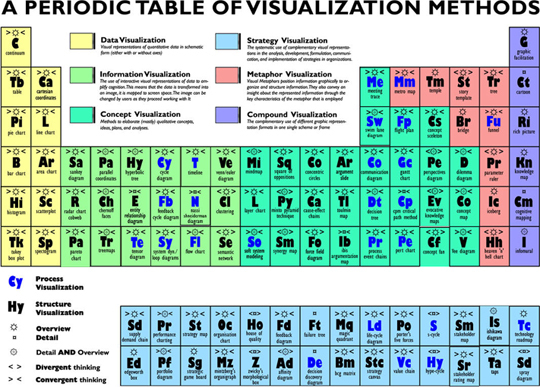 This new periodic table of visualization methods, however, exhibits no such organizing principle. What is the point of doing an entire research project to force a list of visualization methods into a paradigm that doesn’t fit it? Apart from breaking the visualization methods into general categories (information visualization, concept visualization, etc. ), this table exhibits no useful organization. If there are particular attributes that ought to be identified for each method, such as whether it supports overview, detail and overview, or detail views of information, then a column could be included for each, perhaps with a simple check to indicate if it applies. If included, these designations ought to be clearly defined and separated into unambiguous values. I only got as far as looking at the second entry–Table–which was designated as a means to present overview information only, before giving up on this particular distinction as useless. Tables can be used to display overview (summary) information, detail information, or a combination of overview and detail information. I also found the distinction between “divergent thinking” (“adding complexity”) and “convergent thinking” (“reducing complexity”) confusing. I believe that good visualizations neither add to nor reduce complexity, but accurately and as simply as possible represent the level of complexity that exists in the data. I am sorry to single out the authors of this particular research paper, because the problems found in their paper are not uncommon. I welcome their efforts to create a better or more comprehensive taxonomy of visualizations. What I’m saying is that researchers in the field of information visualization ought to present their work in a manner that exhibits practices of effective visual communication, which are well established in the field. You don’t get a pass just because you assume your audience consists of other academics in the field. Even academics understand information better when it is presented clearly. P.S. Anyone looking for an encyclopedic reference for data visualization should consider Information Graphics: A Comprehensive Illustrated Reference, by Robert L. Harris. However, I guess I find this metaphor of the Periodic Table of the Elements more an example of whimsy than a putative example of visual design excellence (which, as far as I can tell, they don’t assert the table is). The fact that on the mouseovers we see examples of pretty poor design of that particular item requires any viewer to have a discriminating sensibility ANYWAY. Then again, we also have to bring such a sensibility to Harris’ everything-and-the-kitchen sink encyclopedic text (sure, alphabetical IS an order, I guess). When I do my my next Society for Technical Communication course, I’ll let the students know about the periodic table. It has some usefulness. But they’ll also see Harris’ book. And Show Me the Numbers, too, of course. In my opinion, all work that purports to be scholarship about data visualization ought to demonstrate best practices of data visualization. I also believe that Ph.D. level research projects ought to be about something more than whimsy. I am at a working meeting today with a handful of data visualization experts (mostly from universities) who all share my opinion about the “Periodic Table of Visualiation Methods.” If it intends to educate people about visualization methods, its presentation should have been designed to suit the information, not to fit a metaphor that doesn’t apply and actually undermines its ability to communicate. There are much better taxonomies of information visualization, if you’re looking for a quick way to introduce people to the field. Thanks for the great work! It really is more than what was expected. I loved its simplicity! Keep up the good work! Havin stumbled across the periodic table sort of by accident, I was intruiged by it. Though I am also very curious about the “better taxonomies of information visualisation” you mention. I do not come from the visualization world, but am interested in what there is out there concerning vizualisation methods. Hopefully you will be able to find the articles on the Web. I believe that the English version of Semiology of Graphics by by Jacques Bertin, a classic text in the field of visualization, is not currently in print, but summaries of his taxonomy are probably included in some of these articles. I stumbled across your blog while waiting up for my teenage son to come home on a Saturday night. I’m AM interested. I know next to nothing about visual communication ( well I am a lawyer – we can’t count and we can’t draw)and I’m sure that in writing to you I will display this profound ignorance. So here goes. I’ll tell you what I think I’m looking for, and if this information doesn’t make any sense I’ll give you the background – which might help. My question is this: do any of the materials you cite about visualisation techniques discuss whether they work with legal primary material ( i.e. legislation and reports of court judgements) ? I am currently writing a chapter on a legal subject for the flagship reference work of the Australian arm of one of biggest legal publishers in the world. This work requires me to summarise ( or is that summarize with a “z”) the essential features of legislation in the nine different legal systems of Australia ( six states and three territories). At last Friday night’s drinks I fell into conversation with a senior executive and suggested we use comparative tables to summarize. Much to my surprise she instantly turned from a sober business woman into a quivering pillar of enthusiam (and no, she was not drunk at the time or captivated by my charms – as far as I could tell)and we then had a quite a lengthy conversation about the theoretical and practical issues involved in visualisation ( oops an “s” has crept in) of legal text. Where should I – as a complete novice ( worse a lawyer) – start investigating this question ? Before talking about specific ways that this information might be represented visually, let’s talk some more about exactly what you’re trying to show. Tell me more about these “essential features of legislation in the nine different legal systems of Australia.” Is the information that you want to show quantitative in nature? For instance, do you want to compare the amounts of legislation that fall into different categories or how these amounts have changed through time? You want to communicate information to people, so the first step is to clarify the message you want to communicate. From there, we can determine if visualization is appropriate and which visual representation in particular will work best. In answer to your question: we are trying to represent the features of a piece of legislation common to the federal level of government as well as the eight states and territories. This legislation – Freedom of Information legislation – is quite detailed and varies in small but significant ways from one state or territory to the next. From a reader’s point of view they need to (a) quickly grasp the essential features of the legislation which applies to their situation, and (b) see where it differs or resembles other states ( so they can see whether case law from another state might help them). By the way I took your advice and borrowed a copy of Harris on Information Graphics and am about to delve into it. Unfortunately, I still don’t know enough about the information to suggest effective ways to present it. I would need to see the data along with a thorough description of what you’re trying to communicate and how people with use and interact with it. This is a bit more than I can handle in this particular venue. In addition to Harris’ book, if you don’t already have it, you will probably find my book Show Me the Numbers helpful. I know most home couputer hve the 3d effects , so wouldn’t it be better , if this concept was appied 2 this subject.the value ov visual representation ,would give valuable insights 2 the younger generation. Also, surely with this visual info , n young minds adaptability ,an isight 2 other aeras ov this field. THEREFORE INJECTIN , MUCH NEEDED INEREST. And I remember one slide where was wrote: “no more than 7 points on a slide”. – It was the eighteenth point on the slide!